Nasi Minyak? Got you wondering? What is Nasi Minyak? Our Malaysian, specifically Malay style (Pucuk Ubi Masak Lemak) rice dish cooked alongside quite a whole list of ingredients. 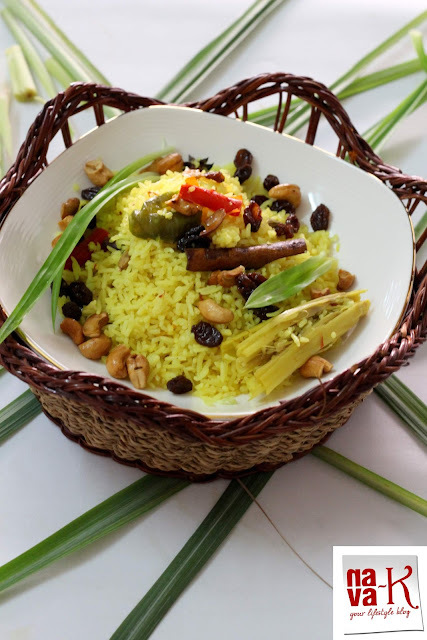 Mainly of course our local herbs and spices, and nasi minyak if I am not wrong, must be regarded as another rice dish trending near, far or close to Briyani (Burmese Briyani, Hyderabadi Vegetable Briyani & Vegetable Briyani). Why? Pretty much the main elements speaking for themselves. 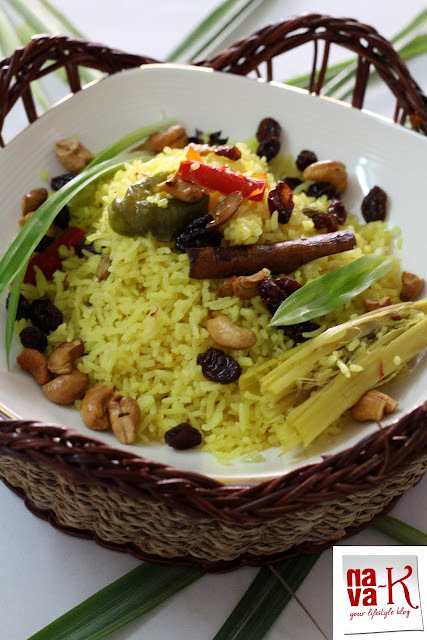 The main elements of ghee (Ghee Rice), spices, nuts, raisin, and of course any kinda of rice dish which is quite outstanding must be made with Basmati rice. We in Malaysia are also not short of our other famed rice dishes (Nasi Kerabu, Nasi Bunga Telang, Nasi Ulam & Nasi Dagang). Each and every one of it is a representation of our Malaysian food colors (Nasi Pudina & Nasi Kunyit) and Nasi Minyak on the whole, a rich, filling, aromatic and like a must have for special occasions rice dish. Furthermore, the pairing for Nasi Minyak is endless. Mostly spicy dishes, or as you wish, as you like (Roti Jala Kari Kambing, Ayam Buah Keluak, Salad Bunga Kantan & Sambal Udang). Heat ghee and fry shallots till crispy. Do the same to the cashews. Then, quickly blister raisins in the same ghee. In the same ghee/pan, saute spices, ginger paste, garlic paste, chillies and lemongrass. Add rice, stir a couple of times and tip into the rice cooker. Pour in milk and water and add turmeric powder, pandan leaves and salt. Stir and cook, thereafter add saffron strands (optional) and fluff up rice. Garnish with fried shallots, cashews and raisins. This looks fabulous! I'll carry on with seasonal and local and sometimes the exotic thrown in for good measure. :) 2015 was good by way of travel. I got see parts of the country that I haven't been to before. Wish you all the best for the year ahead. I hope your mom's health improves. I am all for the simple homemade food. This fits the bill perfectly. Looks so flavorful and delicious. Bookmarked. Wish you a very happy new year! Beautiful presentation Nava.. That's one simple yet aromatic dish. 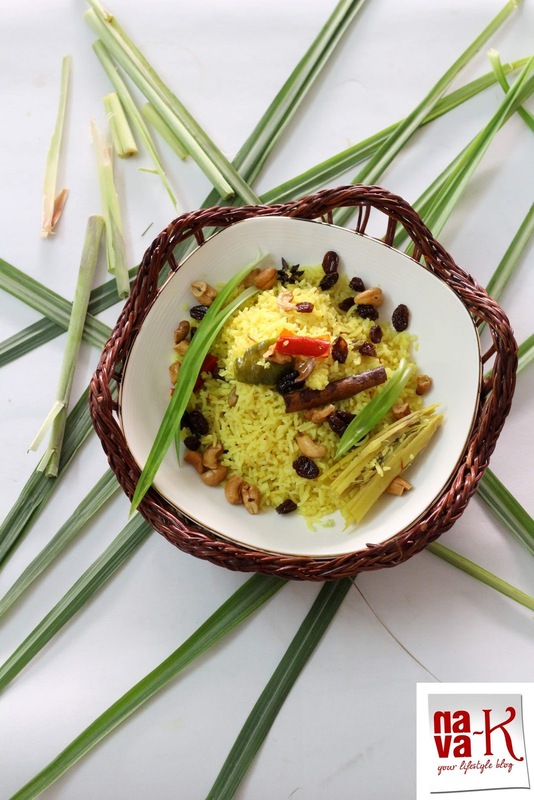 Love the combination of lemon grass and saffron. saffron and lemon grass. such an amazing flavour combo..